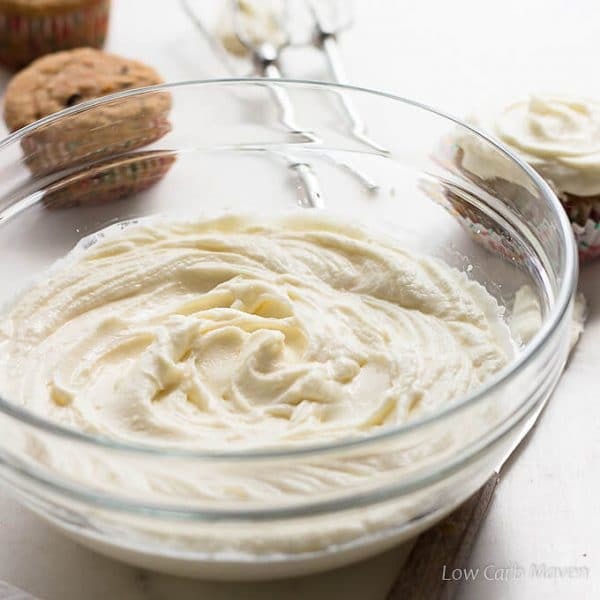 A silky-smooth low carb sugar free cream cheese frosting recipe that’s perfect for carrot cakes, red velvet cakes, layer cakes, and cupcakes. Cream cheese frosting was one of my favorites growing up – especially on my mother’s carrot cake. She made one every year for Easter and slathered it in tangy-sweet cream cheese frosting. It was so good that I often ate just the frosting and left the cake behind. Now that I’m grown with my own children, I continue mom’s Easter tradition and make my family a low carb carrot cake with a sugar free cream cheese frosting (and sometime carrot cupcakes). In fact this frosting is so fast and easy to make, it’s my go-to recipe for decorating all kinds of cupcakes and even layer cakes. Some people don’t care for cream cheese frosting. They don’t like the tang. 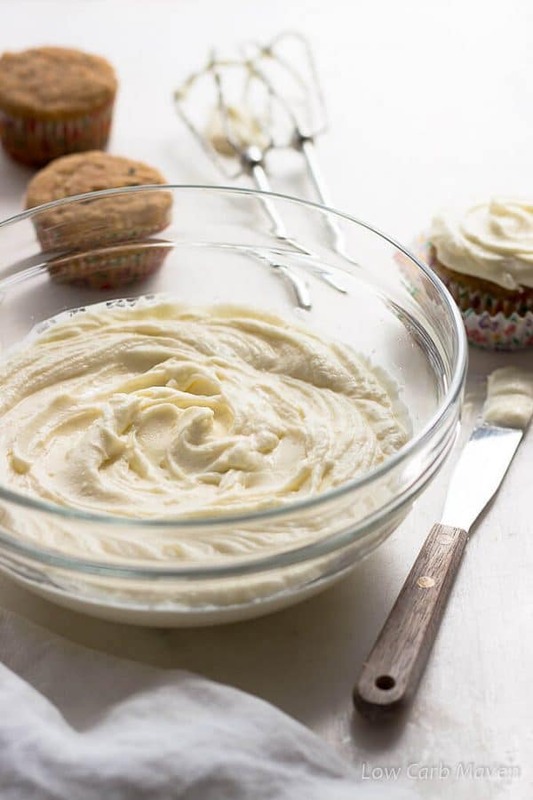 My sugar free cream cheese frosting recipe tames the tanginess by whipping the cream cheese with butter, resulting in a silky-smooth texture. Whipping the ingredients produces a fluffy cream cheese frosting much nicer than the original my mother made, which was a little runny and overly sweet. 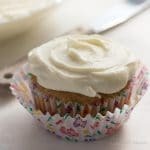 If you are new to low carb you may be wondering how to make cream cheese frosting without sugar. It’s easy. I use a natural low carb sugar alternative like an erythritol/stevia blend in place of the sugar. I like Sukrin Icing Sugar but Swerve Confectioners is another popular brand. Beware: it’s common to see recipes for sugar free cream cheese frosting sweetened with honey or maple syrup. Although these recipes are refined sugar free they contain a lot of sugars and carbohydrates and therefore ore not suitable for diabetics or weight-loss. Stick to the low carb sugar alternatives I mentioned above or use your favorite. 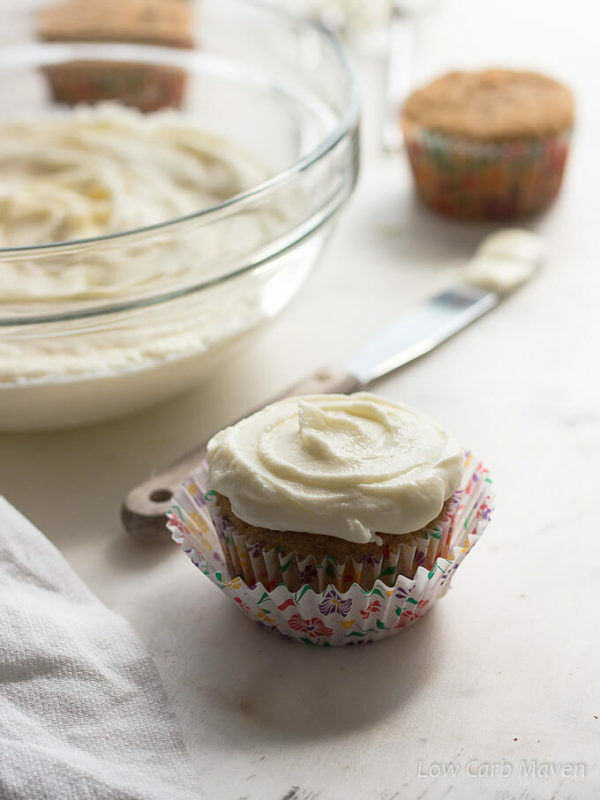 This recipe for Low Carb Sugar Free Cream Cheese Frosting serves 12, at 1 net carb per serving. In a medium bowl, beat the cool cream cheese until smooth. I use a hand mixer. Add the sweetener and beat until lightened in texture. Beat in the vanilla until completely incorporated. Add the butter, beating again until the mixture is whipped together and nice and light. Adjust sweetness with more powdered sweetener or stevia to taste. Refrigerate until ready to use. Beat until light and fluffy before using. Makes approximately 2 cups or enough to generously frost 12 cupcakes. Hi Kim! Not sure if you still check this, but wanted to thank you for this and other sugar free recipes! I’m new to baking sugar free and had a question. I have granulated Splenda already, and limited budget. If I tried to powderize Splenda granules, will it substitute? Have you or anyone else tried? Thanks so much! Hi Cynthia. Yes, you can powder the Splenda but I seem to remember that it doesn’t dissolve very well into the frosting – but that could have been an all butter frosting. It’s been several years since I have used it. What I suggest for the future is to buy generic erythritol (if it’s on your budget) and some Splenda drops (EZ Sweets) or liquid stevia. This would be less expensive than buying name brand 1:1 sugar replacements like Sukrin, Swerve or Lakanto. I find that using a combination of a concentrated sweetener with the erythritol works just as well as the name brand sweeteners. The only thing is the initial outlay in cost. Fortunately, most of them last a very long time. For example, the KAL powdered stevia I buy for my coffee is very expensive, but has 500 servings which are about 1/32 of a teaspoon each. I also use it sometimes in my smoothies or in baked goods. It lasts me well over a year. Same for the stevia glycerite I buy. I like to use that in baking with the erythritol because I don’t think it is as bitter as some of the other liquid stevia brands. Thank so much for all the great info! I have already favorited these so I can come back for recipes. I will try powdering the Splenda and see if I can get it to melt with a lilttle vanilla and cream cheese (gently) bring back to temp and see how the test works out. I’ll let you either way in case someone else asks. You have A GREAT website for design and function. The best I have seen for baking and cooking. Excellent job!! This is my FAVORITE icing. I put it on top of my low carb apple cinnamon muffins and it is the BEST. I usually use Monkfruit powdered sugar because it is my favorite and does not have the ‘cooling’ effect that Swerve has. Thanks SO much for this recipe! I followed Some info that I had read regarding the equivalence of sugarless equivalents, so I ordered a bag of erythritol and 4 ounce bag of Stevia powder I don’t know anything about the sukrin icing, But I know that I could make the erythritol and the Stevia together confectionery, and no longer have to buy my favorite PYURE, not crazy about swerve at all, to each his own, prefer skinny girl drops as opposed to straight up Stevia drops(pyure liquid)Anyhow, in the recipe what would be the equivalent I’m sorry if that sounds redundant but it just seems like such a simple cream cheese frosting recipe as opposed to the others I’ve seen thank you so much this is a great site and a wonderful recipe. Gonna give this a try this morning!!! Sounds great. Where can I find Sukrin icing suger and the stevia glycerite? Holy crap swerve confectioners is freaking magical there is literally no aftertaste I could eat this icing all day yay for a new fat bomb ? thankyou!!! It feels like cheating it’s so good. Would Swerve granulated work instead of Confectioners? Everywhere in my area is on backorder for the Confectioners. What is considered a serving size? I love cream cheese frosting. Can’t wait to give this one a try. This looks really good! Do you think this would be a good option for a smash cake? I’m making my daughter a healthy smash cake without sugar and I wanted a frosting that would hold up better than just heavy whipping cream. Would this work for piping? I love cream cheese frosting, it is my favorite kind actually. It is good to have a low carb alternative for the next batch of cupcakes.